I've been buying turkey meat recently and really enjoying it. It is cheap and tasty, especially if you go for the dark, leg meat. I had used a lot of turkey as a student, but mainly white breast meat, and I really went off it. We never have turkey at Christmas, I find the roast bird dry and gamey, and not to my taste. But the dark meat is lean and succulent and cooks up very similar to goat or spring lamb. I first made turkey mince keema a few months ago, the recipe is given in a previous post, but recently I used turkey leg mince to make a simple ragu for pasta. It was very tasty, with my usual addition ofaniseed flavour, in this case, a piece of cinnamon, and a drop of marmite. The following weekend, I pressure cooked a turkey leg. I had to trim the bony bit to get it to fit well so I could brown it a little, then I added quartered onions, chunks of celery, lots of chunks of carrot, a bag of organic spuds from Abel and Cole, chopped up, a little wine, some stock. Really really basic and simple. But oh so delicious! The meat was so tender, just falling off the "dinosaur" bone. 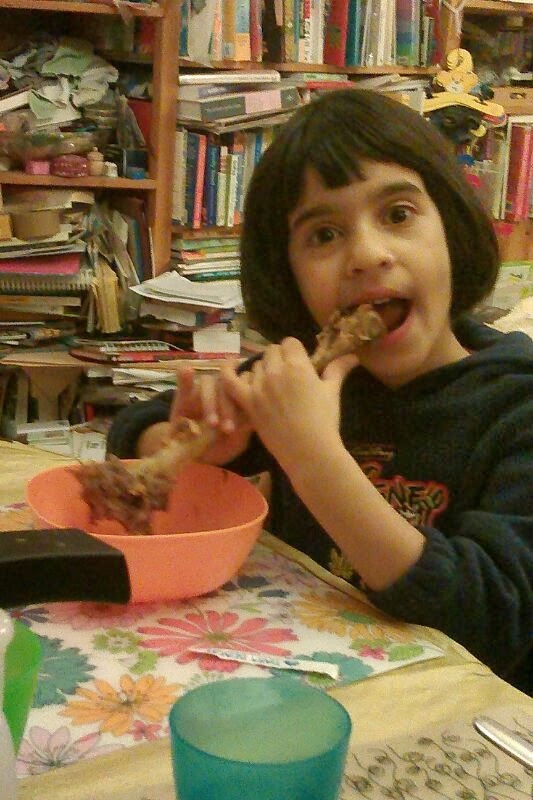 Littl'Un had a blast fishing out the bone and gnawing on it. Today's turkey meal was made from a pack of pre-cubed leg meat. I know prediced meat costs more, but most weekdays, I save so much TIME with these, time I just don't have what with listening to Littl'Un read her reading book, and making sure Tiny doesn't get left out, and waiting to see if Big'Un needs picking up after school, especially when she's got rugby after school...So i choose to save money elsewhere, and on the days when I am not time-poor. So I made a middle Eastern inspired stew type thing, using chopped onions, ground cumin and cinnamon, tinned tomatoes, frozen griddled aubergine slices which I snipped up with scissors. Then I chucked in a tin of chickpeas and let it simmer while I toasted some couscous in butter, then cooked it in stock. By "cooked" I mean stir stock powder through and then add boiling water, simmer for 10 seconds and then switch off and steam for a few minutes. This whole meal was luscious and enjoyed by all. The meat was tender and soft and the aubergines were melty and a delicious extra dimension. If you haven't tried turkey except at Christmas, give it a go! It's cheap, tasty and pretty healthy too!